Ms. B the SLP is a participant in the Amazon Services LLC Associates Program, an affiliate advertising program designed to provide a means for sites to earn advertising fees by advertising and linking to amazon.com. I've decided to start making a one page "therapist guide" to the books I like to use in speech. Although I'd like to have all of my sessions planned out in advance, I'm often scrambling for something to do with my mixed groups just a few minutes before they walk through the door. When this happens, my go-to is to reach for a book. Although I've read all of my books many times, it's still hard to keep track of the therapy possibilities for each off the top of my head. One of my goals for this year is to start a binder with an overview of all of the therapy targets within each book. 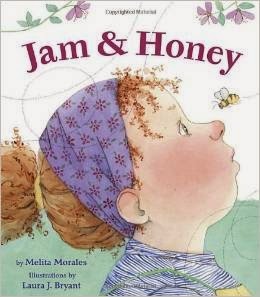 Download the SLP guide for Jam and Honey here. Articulation: There are a bunch of words in this book containing commonly erred sounds! In a mixed group, have articulation students write a list of words with their target sound as you read the book (if they are able to write). After every page or so, have them read through their list and help them add words that they missed. Make it a little competition to encourage the student to pay attention ("I have a list of all the words with the "r" sound from the story right here. There are 21... If you can catch at least 15 you will earn an extra roll on the dice today!"). You can also have them describe the picture/story using phrases/sentences with words from their list or fill-in-the-blank with target words as your read. 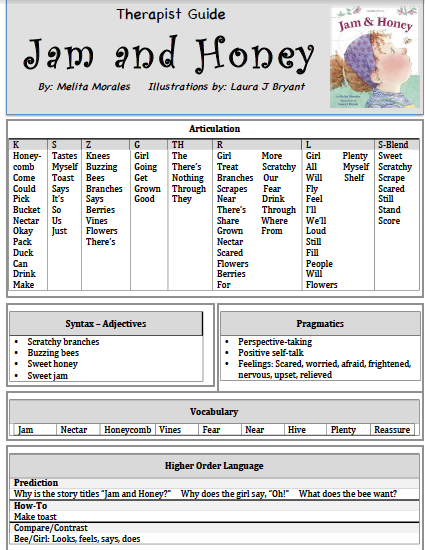 Syntax - Adjectives: The author uses a couple of sensory phrases in this story. Write each on a notecard and have the students brainstorm why you selected those phrases. Guide the students as they discover that the phrases each contain a sensory detail. This is a great introduction to sensory phrases. 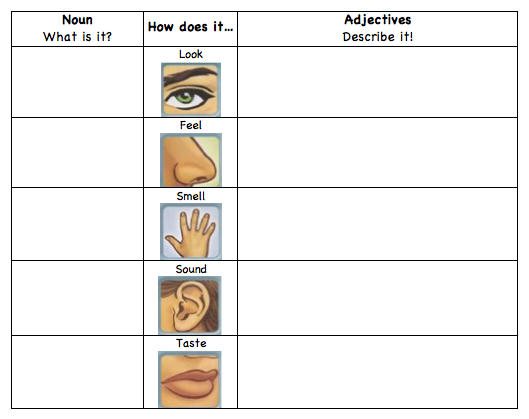 Use my sensory description worksheet for extra practice using developing sensory adjectives. Write some nouns on pieces of paper for the students to draw from a cup (or just pull some cards from HedBandz if you're not feeling very creative :) ). Pragmatics: I love this story for working on perspective taking. The bee and the girl are acting within the same moment in time, yet they both view the event differently and experience different feelings. Explore this concept further using this worksheet. Guide the students to think of events in their own life to complete the chart (especially if they have difficulty in this area - target events could include: shouting out in class, not talking during class, name-calling, throwing belongings, etc.). Many student with pragmatic difficulties struggle with ways to calm themselves when experiencing negative feelings. Call attention to the positive self-talk used by the characters in this story. Encourage students to brainstorm positive self-talk that could be applied when they are feeling agitated. Build vocabulary for feeling/emotion vocabulary. Although these words are not mentioned in the text, you could write them out and have the student complete the phrase "[character] feels ___________ because/when _________." Vocabulary: Most of the words on this list are pretty basic - honey, near, plenty... However, we often greatly over-estimate the amount that language impaired kiddos understand. Even if they are able to demonstrate understanding receptively, often times the breakdown occurs with the expressive bit. Here's a basic chart to use with this story. Whatever method you use, be sure to preview vocabulary, incorporate multiple modalities (writing, pictures, acting out), and review the terms often. Send the vocab pages home for parents to incorporate into conversations in other contexts. Higher Order Language: As you read the story, be sure to ask some questions requiring use of prediction. Model as many predictions as possible and praise students for making logical predictions, regardless of whether they end up being correct. So many of our students are working on describing how-to sequences! Take advantage of the opportunity to have students describe how to make toast - Encourage use of transitional phrases and provide visuals as needed. Of course, there is also an opportunity to compare and contrast the main characters in our story. On the board, write a chart with look-feel-says-does across the top and bee-girl down the side. 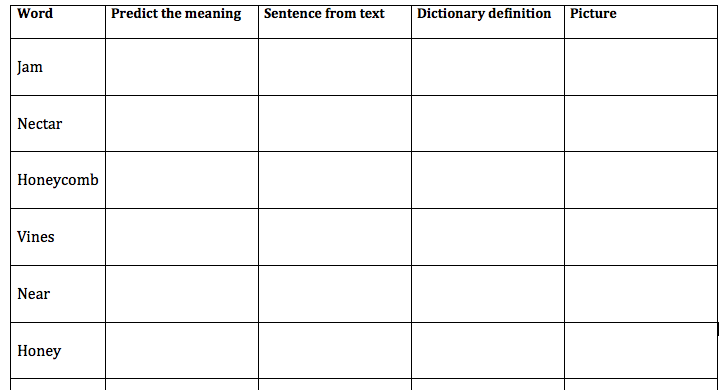 Encourage students to fill in the chart as you read and reflect upon the book. Take it one step further by encouraging the students to use sentences to explain the characters ("The girl is big but the bee is small. Both the girl and the bee are afraid of each other"). As always, if you download a resource please drop a line! Happy speech-ing! I just found your blog. I have been an SLP for almost 19 years now and I have been scouring the internet for new ideas. I LOVE your materials. You have included everything needed for someone to walk into a session and have a great plan. Keep up the great work. Your students are lucky to have such a creative SLP on their team. I am looking forward to future posts. Good luck this year! WOW that is so sweet of you to say! Thanks so much for the support. Have an awesome year!